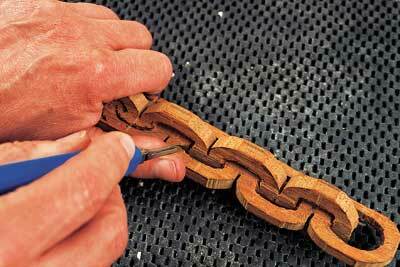 Links or chains are carved from a single piece of wood. They look more complicated than they are, but do require a systematic approach and patience. 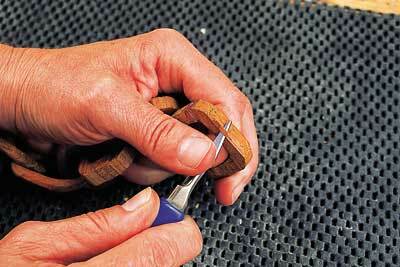 Give prior thought as to how many links you want to carve, and what shape you would like them to be. 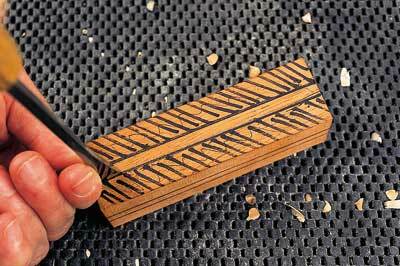 For circular or oval links, you need a square block of wood, but for the latter you will need to draw more elongated shapes. 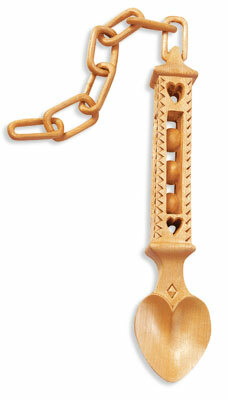 Chains are traditionally featured at the top of a lovespoon, but they can be included anywhere in the design, providing that you make allowances in your pattern for their position and when cutting out the wood. Our piece was carved from a waste piece of mahogany (Swietenia macrophylla), which is not the best choice of wood but looks quite good as the finished article. 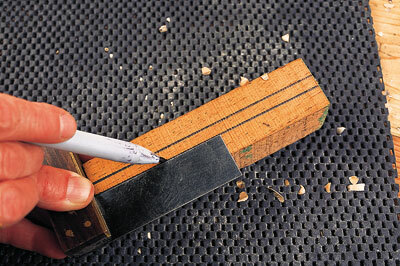 The block of wood measured 38mm (1 1/2in) square by 610mm (24in) long, which was cut into sections to make the method easier to follow. 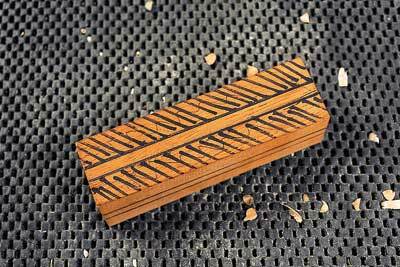 Draw two parallel lines approximately 6mm (1/4in) apart down the centre of your block of wood - depending on the width of your wood, these lines can be wider or narrower (see photo 1). The gap between these two lines forms one of the pillars. Repeat the same method with the remaining three sides. Shade the left- and right-hand margins of all four sides, i.e. from the drawn line to the outer edge, leaving the area between the parallel lines blank (see photo 2). Remove the waste wood from the shaded areas by making stab cuts along the lines (see photo 3) then, using a chisel or router, remove the wood from the top surface until it is level with the top line on each side (see photo 4). This forms the central pillar. 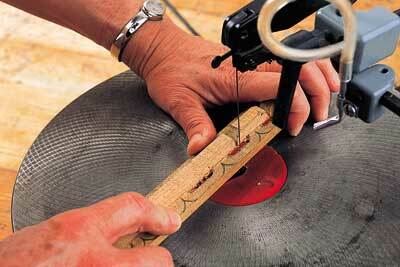 Repeat this method along the remaining three sides until there are four pillars all joined at the centre. Viewed from the front, the shape should resemble a cross, about the same proportions as the Red Cross or first aid symbols (see photo 5). At this stage, sand along the length of each pillar, ready to draw the chains in position. To draw the chain sections onto the wood, first look at your spoon from the front, and then draw your links onto each side of the centre pillar (see photo 6). 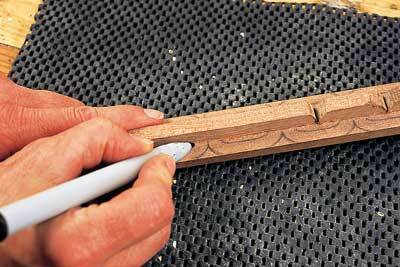 Make sure that both the top and bottom lines match on each side of the pillar. Next, turn the spoon on its side and repeat the method so that they start midway between the links drawn in the previous step. They should begin to look as though they will eventually interlock (see photo 7). When doing this, make sure that the inner line of the horizontal link isn't touching the inner line of the vertical link, as a gap is required to make the separation of links easier. Shading in the internal area to be removed may help. Alternatively, transfer the chain pattern by photocopying those that are already drawn, cut out the appropriate sections and stick them onto the remaining sides, again ensuring that the lines on each side of the central pillar align correctly. 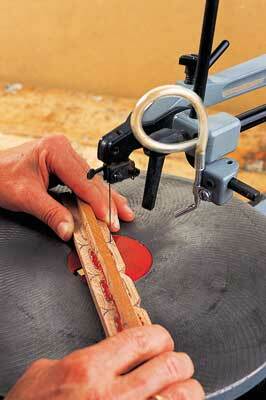 Cut around the outer shapes using a scroll or coping saw (see photo 8). 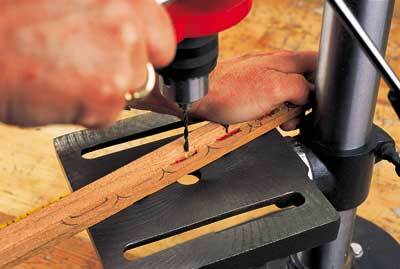 Alternatively, cut out the shape using a knife - but this will take you much longer to do. Begin to remove the waste wood. First drill a hole through each shaded area (see photo 9) and remove this section using a scroll or coping saw (see photo 10). 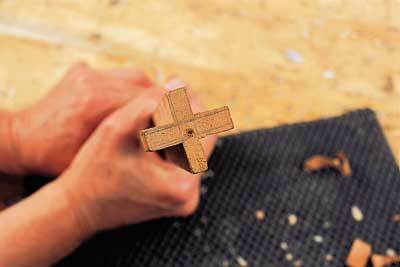 Alternatively, drill multiple holes close together and then remove any remaining wood with a knife or chisel (see photo 11). 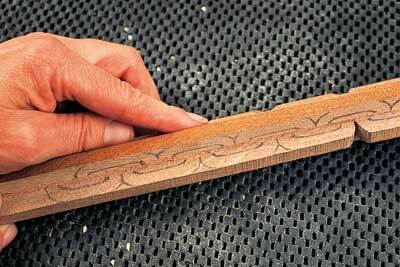 Next, separate the section between the inner and outer lines of each link. 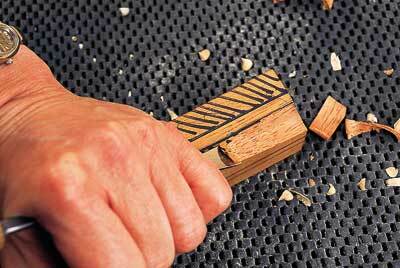 Do this either by using a scalpel knife (see photo 12) to carefully chip the wood away until the chain separates, or use a mini drill with a very fine drill bit. If you choose the latter, keep the drill in line with the wood to be removed in order to alleviate the possibility of drilling into the actual link section. Repeat this until all links are separated. 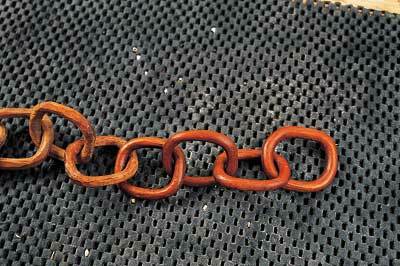 Using a knife, keyhole saw or an old coping saw blade, gently saw between the outer rounded ends of both links to complete the separation process. 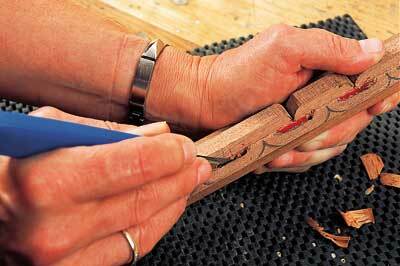 The links at this stage are quite crude, so use a knife to shape the links and reduce the thickness of wood to a more consistent and appropriate size (see photos 13-14). 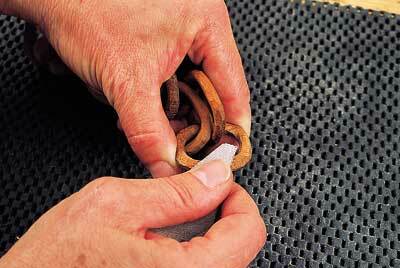 Once satisfied with the shape, sand each link (see photo 15). Finish with shellac and/or wax (see photo 16). 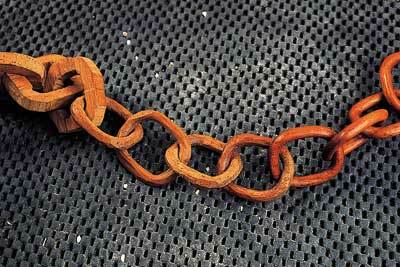 "Chains are traditionally featured at the top of a lovespoon"